I was getting itchy to cut into my new Amy Butler Love fat quarters. So once again, I stopped everything else I was working on and created a baby snowball quilt. I wanted to do something that would showcase the big prints. My favorite is the orange and purple fabric in the middle snowball - love it! The back is simply strips of the fabric - again in an effort to display the large prints. This line is really growing on me the more I look at it. 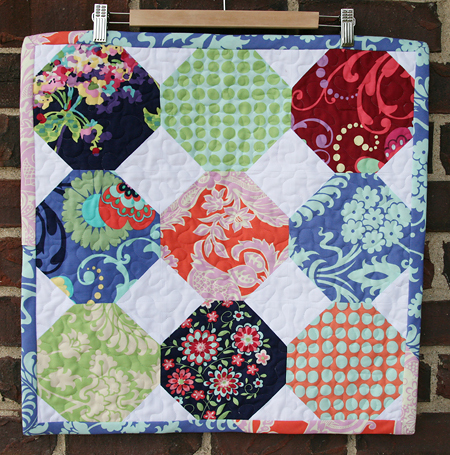 I'm definitely going to go back to the quilt store and buy some more! 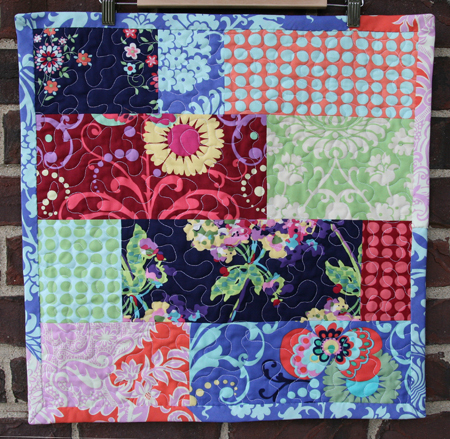 This quilt is a 21" square and was quilted free motion. I used a couple of the prints for the binding. I think it'd be quite cute in a baby nursery or on a tabletop.